First generation for civilian use. 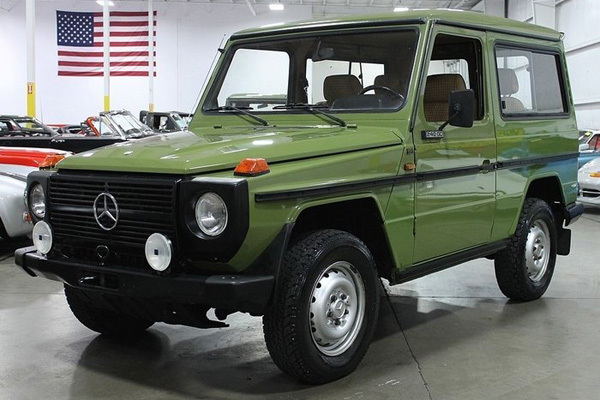 This Mercedes 240GD (Gelandewagen) 4x4 is an all-terrain resilient sport utility vehicle imported from Germany. They were produced by Steyr-Puch in Austria for Mercedes-Benz. This is a civilian version of the military models that were the origination of the body style. This OM616 engine is a 2.4L Diesel in line 4 cylinder. It's a very smooth manual 4 speed. The original pattern on the seats is something rarely seen this side of the Atlantic. This vehicle is all original and in excellent condition inside & out. This is one of the first generations made. This actually was imported from Germany by a collector. These were not brought into the United Stated by Mercedes-Benz. Now that vehicles which are 25 years or older can be imported to the U.S. a few more of these original MBZ 240 and 300 G-Wagons are starting to show up in the United States. They have become very collectible as of late. Development started in 1972, focusing on off road abilities and maximum safety and comfort; with a cooperative agreement between Daimler-Benz and Steyr-Daimler-Puch in Graz, Austria. Mercedes-Benz engineers in Stuttgart were in charge of design and testing, while the team in Graz developed the production plans. The first wooden model was presented to Daimler-Benz management in 1973, with the first drivable prototype beginning various testing including German coalfields, the Sahara Desert, and the Arctic Circle in 1974. Construction commenced on a new production facility in Graz, where the new cross-country vehicle would be assembled nearly entirely by hand in 1975, with production of the "G Model" beginning in Graz in 1979. The first major refinements were introduced in 1981, including an automatic transmission, air conditioning, an auxiliary fuel tank, protective headlamp grilles and a cable winch. Fuel injection became available in 1982, when the 230 GE was introduced in Turin, along with more comfortable and supportive front seats, auxiliary heating, wider tires and fender flares. For 1985, differential locks, central door locking and a tachometer become standard and in 1986 50,000th G Models had been produced. In 1983 a Mercedes 280 G-Wagon won the Paris-Dakar Rallye.